Lancaster City manager Mark Fell. 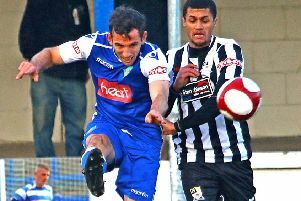 Lancaster City boss Mark Fell has hit out after his side’s FA Trophy replay at Guiseley was postponed at the 11th hour on Tuesday night. The Dolly Blues were just 10 minutes away from the ground when news filtered through that the game had fallen foul of the weather. If seeing an afternoon and evening go to waste was bad enough, the postponement also left a sour taste in the mouth of Fell especially as the Lions have a huge FA Cup second round clash against League One outfit Fleetwood Town this weekend. 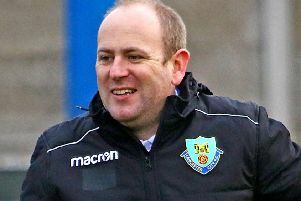 “I was surprised when it was called off,” said Fell, who revealed the rearranged game will take place on Tuesday, December 11, depending on how Guiseley fare in the FA Cup. “I think the nature of how it all panned out makes it hard to feel very cynical about it. “They have a big FA Cup game against Fleetwood coming up. It was called off when we were 10 minutes away. “We had people at the ground – my assistant Graham Lancashire was there. “He said the pitch was wet but playable. We have played on worse. The big question for me is if they wanted the game on why was there nobody working on the pitch? “It is disappointing. The lads had taken half-a-day off work to prepare for a big game. “It was a waste of a day. We could have had a training session – I was even thinking of getting the lads out for a couple of runs on one of the service stations. “Whether this goes in their favour because they will have had one eye on theFleetwood game. Part of Fell’s frustration is that his team should have put the tie to bed on Saturday. Leading 2-1 after putting in a terrific performance, City were denied in the last minute when the National League North outfit equalised. “I have watched the game back and we were brilliant against a team from the division above. We scored two great goals and hit the post and bar. “We conceded in the last minute which is frustrating, but I don’t want that to take away how good we were. It was areally good display. “It gives us confidence for the replay that we can go there and match these kind of teams. “We will need the rub of the green, but I think we ‘ve shown that we will not be going there just to make up the numbers. City return to league action this weekend against North Ferriby United for what is ahuge game at the bottom end of the NPL Premier Division. The Yorkshiremen are bottom of the table and City know victory at the Chadwick Stadium could push them further away from the relegation zone. “It’s a bit of a six-pointer,” said Fell. “They are bottom, but they beat Grantham Town last week. “I think we have lost two league games in eight so we are felling positive about our form. “If we can go there and win, it takes a bit of pressure of us. We could go six or seven points clear of the bottom three. “It’s baby steps, but it will shoe that we are progressing up this division. On the injury front, veteran defender Glen Steel is set to miss this weekend after suffering a suspected broken rib. Loan man Cole Lonsdale is also set for a spell on the sidelines after innocently getting caught in the melee of a brawl on Saturday night in Bolton town centre after a night out. The youngster required a number of stitches in a head wound after being struck by a flying object. One player who is close to a return is Sam Bailey. He has not kicked a ball this season, but could be back within two weeks..